Last year, two hurricanes caused havoc and devastation in parts of the Caribbean, including the British Virgin Islands. The territory has started a rebuilding process and while times have been challenging for them, the spirit of the people and their willingness to stand together to emerge from this tragedy stronger, you could almost say undefeated, is what we can all draw inspiration from. What makes this week even more special is that the reigning Miss World, India's Manushi Chhillar, touched down in Tortola alongside the Beauty With A Purpose team led by MWO CEO, Julia Morley, supported by former Miss World, Stephanie del Valle (who was a first hand witness to the fury of the hurricanes) and the Continental Queens of Beauty. In what can be seen as a feat for the territory, It's the very first time in its 68 year history that the Miss World Organisation is visiting the British Virgin Islands and the Eastern Caribbean. Not only did the team arrive with a donation of $12000, they also came with a special mission - to support a fundraising initiative to rebuild the Eslyn Henley Richiez Learning Center, the territory's only learning center for differently abled people. The center was almost completely destroyed by the hurricane and the cost of rebuilding it will total more than $1 million. 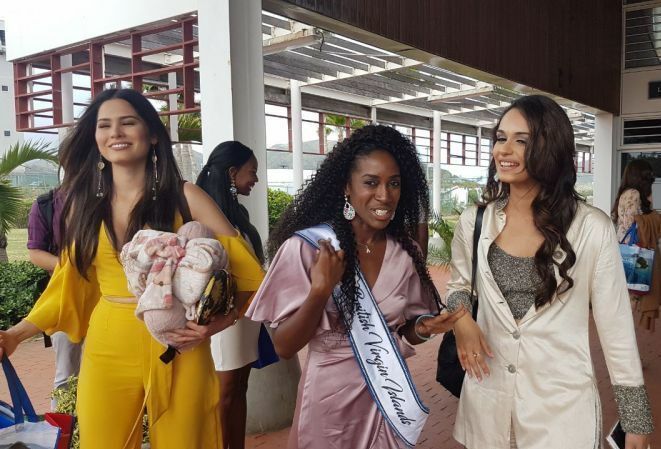 During their 5 day visit to the British Virgin Islands, the Miss World Organisation also hopes to promote the island territory as a tourist destination in order to help and support the recovery and rebuilding endeavors. The tourism industry remains vital to the economy of the British Virgin Islands and now, more than ever, a boost for the tourism industry can help to make a tangible difference. Days before the arrival of Miss World's Beauty With A Purpose delegate, Global Beauties' Andre Sleigh got the opportunity to speak to the reigning Miss World British Virgin Islands, Helina Hewlett, and the Territorial Director of Miss World in the British Virgin Islands, Damion Grange, to learn more about the work they have been doing their plans for the future. Global Beauties (GB): Damion, I met you last year in Sanya and was touched by your passion and commitment as we chatted about our shared love for Miss World. You are the Territorial Director for the British Virgin Islands. Could you tell us how your involvement with the Miss World Organisation started? Damion Grange: I was just a little boy planted in rural Jamaica watching an interview by one of my favorite local TV hosts, Faye Hellington (maybe because she was from rural Jamaica as well and worked hard to become a national treasure) interviewing one of the most stunning young woman I had ever seen. The striking thing for me was that in addition to being physically attractive, as the interview progressed, I began to admire her eloquence, poise and warmth which I could feel through the television screen. She was Sandra Foster, Miss Jamaica World 1991, who went on to place fourth overall at the Miss World Finals later that year. I remember the pride I felt watching her make Jamaica proud and then following her amazing journey. It was then I realized that Miss World was not just about beauty but rather a platform of purpose and philanthropy - as Sandra was very busy working to improve lives and make a difference in her country. Jamaica continued to do well over the years and I remained a fan of the prestigious Miss World organization since then. Later in life, I migrated to the British Virgin Islands, my new home, and I noticed that the British Territory participates in other regional and international pageants but not Miss World. When I enquired, I found out that there were representations in the past, but for reasons unknown to me, the territory was absent from the pageant for a number of years. Having that nostalgic connection to Miss World, I made it my mission to see the beautiful British Virgin Islands represented at Miss World once again. Consequently, with a small but hardworking team - after a 12-year absence - it has now been five years since the BVI has returned to the Beauty with a Purpose Stage. GB: What have you learned during your time as Territorial Director? Damion Grange (DG): I have learnt much but I’ll narrow it to the one that’s most pleasing to me. While I knew the heart of Miss World had morphed into the realm of philanthropic beats, I can now say with absolutely certainty that the core of this amazing organization sincerely lives by this principle. The fact that, without hesitation, Julia Morley was willing to contribute to our local effort to rebuild after our territory was struck by the historic hurricanes, Irma and Maria, may have something to do with that. In addition to a welcomed financial contribution, Miss World has traveled to the BVI to help us in our recovery efforts. This pleasant surprise was a lesson, proving that Miss World is a family. GB: What are some of the challenges you are facing as Territorial Director in the British Virgin Islands? DG: I think the stereotypes of pageants continue to haunt us and coupled with the fact that the BVI’s population is just under the 30,000 range; we find that it’s challenging to generate sponsors' buy in. This then creates a major challenge for us to meet our financial obligations and it essentially puts our representatives at a disadvantage when preparing for the Miss World Finals. Additionally, this also limits the pool of eligible young women necessary to host a solid Territorial Final each year. I am proud to be first National Director from the Eastern Caribbean to host the Miss World Organisation and I have learnt that we truly are a family. GB: What has been your proudest achievement during your time as Territorial Director? DG: Proudest moment is relative actually; I’m most proud to see young women find purpose and transform into confident and productive citizens, then I am even prouder whenever they make impressive showings at Miss World. However, I am absolutely proud to have the opportunity to be the first National Director from the Eastern Caribbean to host the Miss World delegation. GB: How do you plan to build the Miss World brand in the BVI? DG: Along with my hardworking team, we will keep eroding the negative stereotypes of pageantry by continuing to create a platform that proves our young women are smart, good-natured and driven by a common cause - and that is to make a positive impact on their community and, by large, the world. As it relates to the Miss World brand, we believe that we are currently on the trajectory that will see its continued success. For example, we continue to support a number of social causes and nonprofit organizations locally, our work with children that are differently abled is dear to us, and so we now work to help in the rebuilding of their school that was completely damaged by hurricanes. It is our belief that as we continue to embrace the core of Miss World, and live proactively by our mantra Beauty with a Purpose, the strength and vitality of the Miss World brand is then eminent. GB: Could you share some details about the search for this year’s Miss World delegate? DG: Our committee is already actively engaged in the process of finding our next Miss British Virgin Islands World representative. We have already reached out to those who may have shown some interest in the past and just now finalize a plan to host a casting call for potential contestants. We desire to see the British Virgin Islands having the unique opportunity to capture the Miss World title and so the mission is ongoing. "The mission is ongoing. We are creating a platform that proves our young women are smart, good-natured and driven by the common cause of making a positive impact." Helina Hewlett was selected to represent the British Virgin Islands at Miss World 2017 in Sanya. She brought joy and pride to her territory when she performed exceptionally well in the Sports Challenge, winning the bronze medal, and made it to the top 20 of Beauty With A Purpose. When talking to her, you soon realize how her her participation in Miss World changed her life and her hopes and dreams for the future. Miss World British Virgin Islands 2017, Helina Hewlett: Your future is dependent on nothing and no one but you. Global Beauties (GB): The British Virgin Islands were ravaged by two hurricanes last year around the same time you were preparing for the Miss World contest. Tell us about some of the challenges you had to overcome to make it to Miss World. Helina Hewlett (HH): The main challenge faced as a team was not being able to have full financial support behind us, so as a team we had to put together personal funds and rally outside sources for assistance with some of the necessary items needed for the upcoming show. Lines of communication especially due to the fact that the territories telecom service was severely affected, also played a major part in difficulties faced and so the time that we had to prepare felt even less than it already was. GB: What was your Miss World experience like? Any highlights you would like to share? HH: The Miss World experience is indescribable and unimaginable… whenever I am asked this question, I do not even know where to begin. However, one highlight I would like to share was my sports challenge experience. After having fainted at the opening ceremony in Sanya a few days before, I was very worried about being hydrated enough to participate equally in this challenge and decided to go all out for every challenge that was given to us. Here came my surprise, I made it to the top 8 of my sports team, won my first race, broke the Miss World skipping record and even placed top 3 in the sports challenge. I felt so much joy and pride when I was able to walk away with so much earned for my territory. That was definitely the highlight of my experience in China. "I felt so much joy and pride when I was able to walk away with so much earned for my territory." GB: Tell us about the support you have received in the BVI before/since Miss World. HH: I have been overwhelmed by the amount of support I have received from my fellow BVI Islanders. From the moment I became Miss World BVI to this very day, I often get stopped just to have conversations about how China was and how proud they are of me and what I have done for the territory. GB: What is next for you? HH: The Miss World journey has actually been a huge inspiration for me and a push in the right direction. This journey has encouraged me to step out and begin my very own fundraising group which is called 'Retreat for Change'. I have based my group on the saying "Be the Change you wish to see in the world", because as we all know CHANGE starts with YOU. My hopes for this fundraising group is to begin an annual retreat that will fuel community spirit and urge others to help continuously to raise funds for community projects. The people in the community is what makes up the community and their beliefs, so as a people we need to begin doing our part to make a difference. I also hope that this will be a concept adopted in neighboring islands and countries all around the world. This is my movement and my bid for change. "I am so excited that the Miss World Organisation came to support our project." GB: What message do you have for young women who would like to compete internationally? HH: Always believe in you and your dreams and stay focused because life is only as hard as you make it. In the world today, right at your doorstep, as a matter of fact right at your fingertips you have all of the knowledge and materials that you need to be the best you that you can be. Your future is dependent on nothing and no one but you. So just be you and keep moving and remember while you are sleeping others are working. Andre Sleigh, a South African based in Shanghai, joined the Global Beauties Team in August 2017. He is also the founder and editor of Eye For Beauty Blog (www.eyeforbeautyblog.com) and has been following pageants for the past 27 years.